I am an 18 year old left-handed pitcher in my first year of college baseball. I have been rehabbing a shoulder injury for several months now, and have just returned to throwing off the mound. Over the course of my bullpens since my return to throwing (I had followed a rehab throwing program from 30 ft-180 ft prior to returning to mound), I have found that my accuracy has been inconsistent. One bullpen I will throw confidently and accurately with smooth, comfortable mechanics, but then the next bullpen I will make a few bad pitches, lose my confidence, and fall out of my mechanics. This had been a problem for me prior to the injury, as my senior season of high school I had command and confidence inconsistency issues on the mound as well, and now that I’m returning to throwing to batters for the first time in 5 months, confidence is hard to attain given my inconsistencies so far. I have explored both mechanical and mental fixes (for example, watching video of myself to find mechanical issues, and on the mental side, reading H.A. Dorfman’s “Mental ABCs of Pitching”). The most notable mechanical flaw that I have seen within myself is my inconsistent arm path. This was something that was largely affected by my shoulder injury, but yet now at full health, I still find myself having a different arm path for several pitches in a bullpen. I’m naturally at a three quarter arm slot, but there are times where I will see myself dropping my arm slot lower and coming across my body, often leading to pitches way outside in either direction. The main questions within my post are these: How can I train myself to regain a consistent arm slot again, and overall, regain a consistent set of mechanics? Also, what are some tips in order to improve confidence in ones mechanics and overall ability? Here is a video of my most recent bullpen (https://www.youtube.com/watch?v=CPOZDupaNEw&feature=youtu.be). I’d love to hear opinions on what I can fix, and how I can improve both physically and mentally, and return to the dominant pitcher I was before. Thank you! coming off of rehab is a tough one. Your body is/has shifted a lot of its movement history, to the stronger suit, regardless if you know it or not. In fact, your rehab professional(s) have probably brought this to your attention and advised you to certain fact’s of life that you’ll be dealing with a lot. you’re upright position as you start and finish your leg lift, stays pretty much “as is” - upright, throughout your downward progression on this portable mound. Your head does not focus on your target down range - but, starts to turn sideways towards your glove side very early into your pitch. You mid section (abdominals) has very little flexibility, thus keeping you upright as you descend the mound. 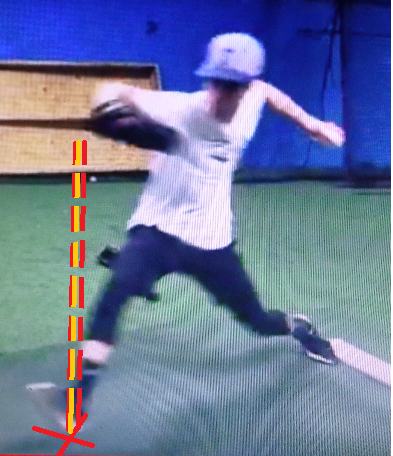 The result of all this has your head snapping to the glove side, your pivot foot comes off the ground way too early, and thus you turn on the toe of your pivot foot - twisting you heel, thus snapping your pivot foot up in the air behind you balancing your overall upper body. Finally, the combination of all this has you peter panning off to the side. Your shoulder movement has a lot to do with all this - which has be narrated in the video provided. Study all that’s been mention and you should be in good shape. Rehab work with youngsters your age is a touchy thing. There’s so much going on at your age that it’s had to nail down exactly what’s-what, day to day. Your main concern has to be recovery for the long haul, not paying a price for rushing things and trying to do more than you body can handle. In fact, the human shoulder is one of the most complex muscle structure in the body - yet, the demands placed on it can easily over match is design and purpose. Go easy here, listen to your body when it’s trying to tell you things. I agree with coach Baker and Dan. The big thing I see, is you eyes are all over the place. Just like hitting. If your eyes are moving, then you will perceive that the ball is moving. If you do not focus on your target, or if you try to pick it up late, you will have inconsistent results. “Aim small, miss small”. Try to keep your eyes level and focused throughout your delivery. Confidence will come with repeated positive results. Pick one thing at a time, and work on it until you get positive results. Then move on to the next issue. 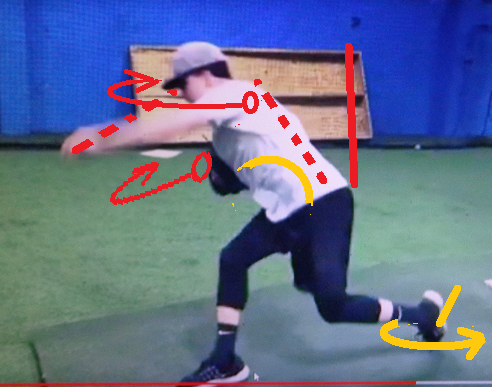 Grab some masking tape and tape off a straight line from your back heel towards home plate, try to stay withing a few inches of that line on landing. A vertical visual line behind home plate that lines up with the one on the mound helps. The other thing I see is similar to what Dan B said about arm action… I think you start well and are in synch at the start but your glove hand tucks really early and therefore it does not help the timing of your release. . I teach it as thumb down and I also like having the entire arm rotated in, it just seems to help keep the two arms in synch, don’t know why, just feels like you can tell what the other shoulder and arm are doing when your glove arm is rotated down until it can’t rotate any further. Regardless, the point was I believe your glove hand tucks too early and doesn’t help your timing of release. Good luck and remember, Follow the scientific method when making adjustments, ie. try one thing at a time and not a bunch of changes at once. The human body has an amazing way of balancing itself and even while in motion. What you see in the picture below is just that process. Your glove arm extends out and then stops …. thus … your lower body, the legs in particular, stop right along with you glove arm and… balances you off, by your stride leg extending then planning the stride foot where you see in the picture below. I would suggest extending your glove arm out just a bit more, and delaying your comital of your stride slightly. This will allow your body to get use to stretching out your glove arm more to the front, and in many ways, a line you shoulders - both of them, to point directly at your target. Your glove hand will stop more in front of you, allowing your stride foot to plant itself directly underneath it.